We listen closely and bring dreams to life. Our clients each have a story that they want told. Our job is to figure out how to tell that story in a built world. We are in the business of making our client’s dream a reality. U-Studios Incorporated develops physical solutions to bring our clients’ dreams to life in sustainable projects. We tell each client’s story to their guests in a way that encourages the guests to stay longer and return for additional experiences. This will sustain our client’s dream. 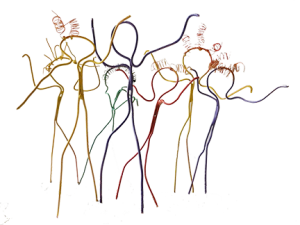 Our stick figure mascot “U” represents a highly valued member of our team – YOU. As our client or “guest,” we can say, “U are part of our team.” Our stick figures in the office always remind us that we work for one common goal – to bring our clients’ dreams to life. We pledge to work closely with you as a creative partner from concept design through construction to make our design and creative services an enjoyable experience. With years of experience, artistic talents, unlimited creativity and energy, we work collaboratively at U-Studios to bring a higher level of creativity and imagination to every project we design and plan. Treating our clients as our guests. Honesty on all levels, because trust is the key to a strong relationship. Reliability to follow through on our commitments. Loyalty to our guest, which means putting the guest’s dream first. Respect for everyone on the team. Thank for your trusting us to do our best to fulfill your dream. U-Studios Incorporated is a full-service creative company providing architectural and engineering services, fine art, art direction, and theatrical design and consultation. Our designers & production staff have experience working for national and international entertainment and theme park clients as well as Hospitality & Resorts, Commercial & Office facilities, Retail & Restaurants and regional theater organizations. Because guest satisfaction is paramount to your business, our primary mission is to help you provide an environment that brings visitors back again and again. We listen to our clients first so that we truly understand their goals and how a project fits into their larger business. Then we study the operational impact of the proposed project and finally craft a solution that optimizes guest experience while balancing operational requirements. U-Studios Incorporated can trace its roots back to James P. Jamieson, who came from Philadelphia to St. Louis to help oversee design and construction for the 1904 St. Louis World’s Fair. From the beginning, the firm has been involved with creative and innovative projects. U-Studios Incorporated’s principals have 60 years combined experience in art, architecture and engineering, entertainment facilities, scenic and lighting design, fabrication and installation. Developing an immersive environment is what we do. Let us do it for U.